Definition at line 375 of file TargetLibraryInfo.h. Definition at line 1567 of file TargetLibraryInfo.cpp. Definition at line 1572 of file TargetLibraryInfo.cpp. Definition at line 1577 of file TargetLibraryInfo.cpp. 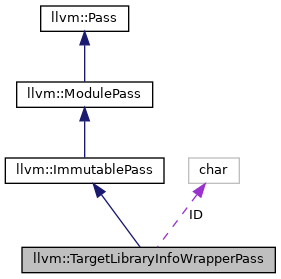 References llvm::PassRegistry::getPassRegistry(), ID, INITIALIZE_PASS, and llvm::initializeTargetLibraryInfoWrapperPassPass(). Definition at line 387 of file TargetLibraryInfo.h. Referenced by llvm::createLegacyPMAAResults(), and llvm::getBestSimplifyQuery(). Definition at line 388 of file TargetLibraryInfo.h. Definition at line 382 of file TargetLibraryInfo.h.